Peter H. Schmitt was born 22 May, 1948. He studied Mathematics and Physics at the University of Heidelberg. In 1975 he obtained his doctorate in Mathematics at the University of Heidelberg. His main research interest at that time was in Mathematical Logic. From summer 1975 to summer 1976 he held a post-doc position at Simon Fraser University, British Columbia, Canada. He was a visiting researcher at the Hebrew University of Jerusalem for a month during the "International Logic Year", 1981. In 1983 he obtained his Habilitation (2. PhD) at the University of Heidelberg. From 1984 to 1988 he worked for IBM Germany. His main assignment was within the LILOG project. From 1988 to 2014 he was a fulll professor for Theoretical Computer Science at the University of Karlsruhe (since 2006 Karlsruhe Institute of Technology). 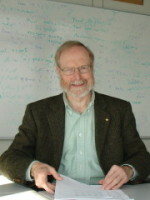 His main research interests lie in the area of Formal Methods: formal specification, programm verification, automated reasoning. He is one of the founding fathers of the KeY project. Peter Schmitt retired from his professorship in October, 2014. He is a member of the Supervisory Board of the Leibniz-Zentrum für Informatik, Schloß Dagstuhl.